John Lindsay Abraham Beame William F. Buckley, Jr. The New York City mayoral election of 1965 occurred on Tuesday, November 2, 1965, with Republican Congressman John Lindsay winning a close plurality victory over the Democratic candidate, New York City Comptroller Abraham Beame. Lindsay received 44.99% of the vote to Beame's 40.98%, a victory margin of 4.01%. Finishing in a distant third was the candidate of the recently formed Conservative Party, conservative author and commentator William F. Buckley, Jr., who received 13.36% of the vote. Lindsay, a liberal Republican, also was the nominee of the Liberal Party. Beame also received the Civil Service ballot line. Lindsay won a decisive majority in Manhattan, while winning comfortable plurality victories in Queens and Staten Island. 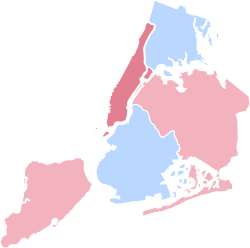 Beame won pluralities in the Bronx and Brooklyn. Linsday would be sworn into office in January 1966, replacing outgoing Democratic Mayor Robert F. Wagner, Jr..
How Public Housing Transformed New York City 1935-67...part one. ^ "New York City Mayoral Election 1965". Our Campaigns. Retrieved 25 April 2014.